Background: The history of human populations occupying the plains and mountain ridges separating Europe from Asia has been eventful, as these natural obstacles were crossed westward by multiple waves of Turkic and Uralic-speaking migrants as well as eastward by Europeans. Unfortunately, the material records of history of this region are not dense enough to reconstruct details of population history. These considerations stimulate growing interest to obtain a genetic picture of the demographic history of migrations and admixture in Northern Eurasia. Results: We genotyped and analyzed 1076 individuals from 30 populations with geographical coverage spanning from Baltic Sea to Baikal Lake. Our dense sampling allowed us to describe in detail the population structure, provide insight into genomic history of numerous European and Asian populations, and significantly increase quantity of genetic data available for modern populations in region of North Eurasia. Our study doubles the amount of genome-wide profiles available for this region. 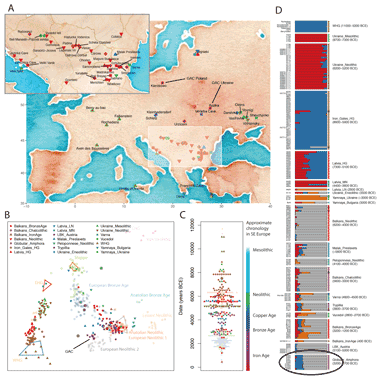 Conclusions: Our project has patched the hole in the genetic map of Eurasia: we demonstrated complexity of genetic structure of Northern Eurasians, existence of East-West and North-South genetic gradients, and assessed different inputs of ancient populations into modern populations. All samples are brand new??? Not taken from Yunusbaev, Behar or similar old studies? Dunno, but don't think so. The modern Bashkirs live where Hungarians lived before moving west and probably this is the place where their Turkic-Uralic "amalgam" formed. (At least the elite of the end 9th century conquerors was such an amalgam.) Among the sampled populations Khanty are the closest to modern Hungarian linguistically. (The actual closest is Southern Mansi, but that population is not sampled here.) So it makes some historical sense that among the sampled Uralic speaking populations Khanty have the most IBD sharing with Bashkirs.